NASA have unveiled exciting new high-quality images of the dwarf planet, Ceres, captured by the Dawn space probe. The “highly anticipated” pictures of Ceres give scientists fascinating new views and a greater understanding of the “alien world”. As Dawn moves closer to the planet, the surface craters and mountains it photographs can be examined in unparalleled detail. The new in-depth pictures of Ceres’ craters show evidence of an intriguing “bright material” which indicate a “kind of salt” on the surface, according to the space agency, and suggests an impact occurred in “recent geological time” - within the last 80 million years. 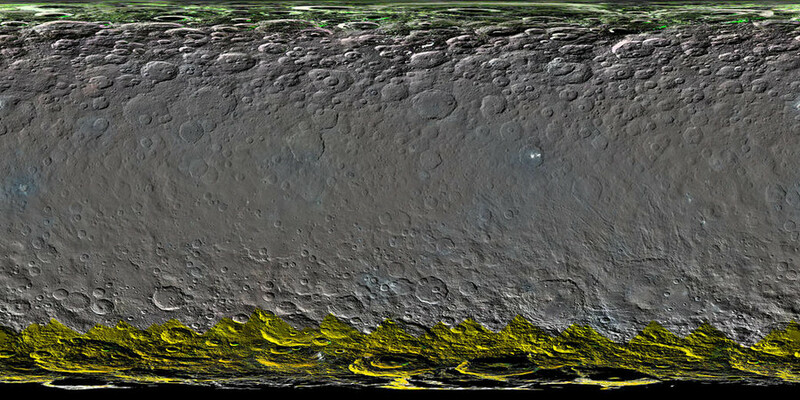 NASA also released an enhanced color map emphasizing the variety of terrain on Ceres’ surface. Blue in the middle of the image below, for example, relates to flows, smooth plains and mountains. 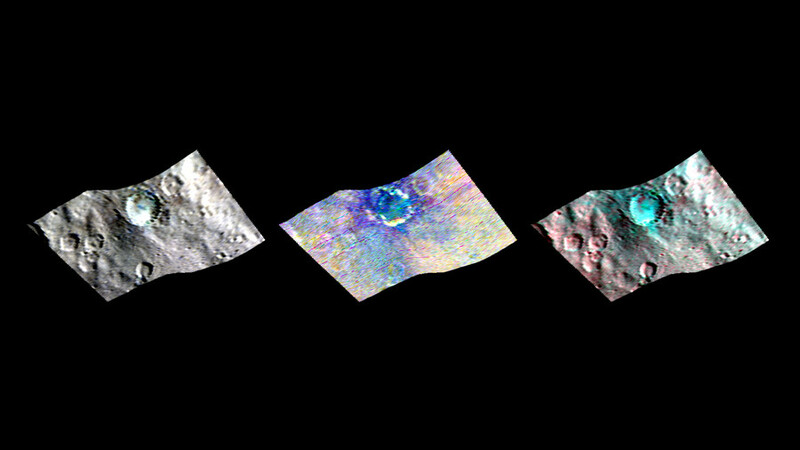 The image on the right shows red or blue based on the temperature of the surface, and the image on the left shows the brightness variations on the Haulani crater. Infrared mapping of Ceres (see image at the top of the page) showed the planet has various wavelengths of sunlight, which allow scientists to identify the surface material composition. The map shows the diversity in the neutron count (blue being the lowest and red being the highest). A lower neutron count near the northern hemisphere indicates the presence of water ice within about a yard (90cm) of the surface. At Oxo Crater, the VIR (visible infrared spectrometer) instrument detected water. Scientists believe the water could have been exposed during a landslide or impact - or possibly both. Either way the exciting discovery marks the only place where water has been detected on Ceres' surface so far. 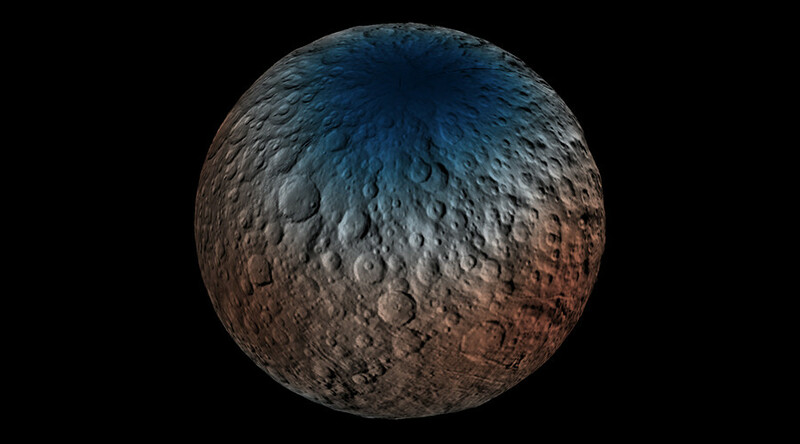 Before Ceres, Dawn explored a different “protoplanet”, Vesta, from 2011 until Dawn entered Ceres’ orbit in March 2015 as part of a mission in NASA’s Discovery Program. The images, taken 240 miles (385km) above Ceres’ surface, were unveiled at the 47th annual Lunar and Planetary Science Conference in The Woodlands, Texas, on Tuesday. Dawn will continue to observe the dwarf planet in the hope of uncovering even more scientific data.